You Can Now Curve Text in Design Space! It’s here! It’s here! You all have been asking for...curved text and we are here to deliver! If your mind is flowing with creative ideas like ours is right now, let’s jump into the software and curve all the things! We will show you just how simple it really is. 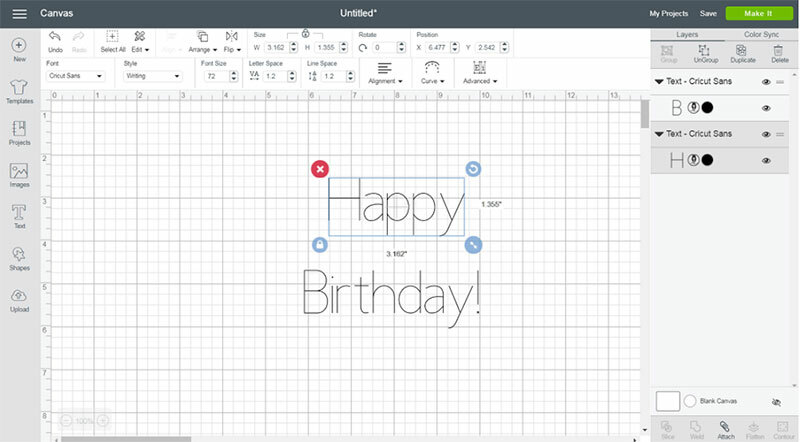 The Curve tool can be found in the Text Edit bar at the top of the Canvas, between the Alignment and Advanced tools. Click on the text icon, and type whatever your heart desires, for this project we will be using the words “Happy Birthday”. Choose your font, font style, and use the Letter Space tool to adjust letter spacing as needed. If you have multiple lines of text you are wanting to curve you will want to create a separate text box, or use the “Ungroup to Lines” tool to separate your lines of text just how you want them. Now for the fun part - click the Curve tool. Don’t see it on your toolbar? Make sure your full screen is open on your computer. If it isn’t all the way open check for the “More” button and you will see it under that menu. Once you highlight your text and click the curve option it will take a few moments to register and then display a slider and number field. Drag the slider to achieve your desired curve. Wondering what those numbers mean? The Number in the Diameter field is measuring an imaginary circle to determine the curvature of the text. So in the video, you will see us taking the diameter number of the first line. For our project, we copied that number and applied a (-) sign to create the inverse of that top line. Now we have the look we want with even curvature and we can adjust the spacing as needed with the Line Space tool. Remember that the Curve tool will only enable for single lines of text! The Curve tool cannot be used on text that has been ungrouped to individual letters, then regrouped, so if additional manual letter spacing adjustments are needed after you have used the Letter Spacing tool, wait until you have curved the text to do this. Before we get to crafting our project we wanted to share with you some final nitty gritty details! Curved text will remain completely editable unless welded or flattened. You can continue to adjust letter spacing, rotate, edit the text, and change the font style and style after curving your text! The Curve tool is currently only available in your desktop computer version of Design Space. At this time, projects containing curved text will not open in mobile apps. However, if your text has been welded or flattened so that is functions as an image rather than a text box, the project can be opened in mobile apps. Our head is swimming with ideas and we can’t wait to see what you will add some curve to! Head over to https://design.cricut.com to try the brand new tool out! Like what you see? Be sure to share this to your Facebook or Pinterest to refer to later or share with a friend! Will the iOS app be updated with the curve feature soon? Thank you for the curve text! It will save me and other crafters a lot of time. Now we don’t have to use another software program to do such a task! It would be great if y’all could offer a rhinestone template program! I do not have a computer I only have A iPad and an iPhone how long for the curved text comes for them? Soon please and thank you. Hurry up and get this feature in mobile apps. I only have an iPad. Love you much Cricut!! Hi, I just wanted to say thank you for adding the Curve tool. I am looking forward to using it. I do have a questions which I am pretty sure others have asked. Do you have an estimated time when it will be available to use on the Design space app? Can curved text also be done on the IOS app? Yay!! Of course this is just days after I made a YouTube tutorial for curving text!! LOL! my design space software does not have the curve icon. Try logging out and back in if it still doesn’t work. Neither my beta app on Android nor my iPad have the curve feature. When will this be fixed? I have spent quite a bit a money on Cricut and seem to be unable to do what I most need to. Bought an iPad instead of MacBook now can’t use the maker for the knife blade crafts that I waited since launch for. Feeling really taken advantage of. How soon will this feature be incorporated in to the App? Absolutely love the new Curve Text feature! You know us Cricuteers, we are always looking for the next creative problem for Cricut to solve. Keep up the great work. Thank you so very much! I love the new curved text feature! Does the new curve feature work on the iPad Cricut app? I need this to work on my laptop! i have an old cricut, will i be able to do anything new with it? These updates are being made in Design Space, which is used by the Explore series and the Maker. I’m oh so very excited about this new feature. It will trim some time off the creating phase of my crafting. However, I’m using my iPad (iOS) to access design space, and am unable to use this feature. Seems the program runs differently across platforms. Will this feature become available on iOS? I have been wanting this feature for a long time! I can’t wait to us it! Thank you for making it happen! Wish it were easier to use curly fonts with just design space. Can you curve text on the app or just on the computer?? Curved text has not been added to the app yet. I am so excoted about the curve. It took me hours to figure how to curve before. I have tried it and it is instantly in a curve. Thanks so much. …impatiently waiting for it to be available on iPad. I bought it specifically to be used with my Maker. I’m so disappointed that I cant use the curve feature or do wood projects. Please, please make these features available for the iPad. Any chance the curved text feature will be added to the app soon? Is the curve text going to be offered on the app in the furture? Just wondering if it’s in the works. I only have an iPad. I absolutely LOVE the curve tool in design space!! Just wondering how close we are to be updating the iOS design space app with this cool handy feature? Thanks cricut for all you do!! Curved text feature needs to be available on my iPad. It is ridiculous to have a feature which is only available to some users. Get it together cricut and test all customers the same. I am rethinking my plan to upgrade to a Maker.